Notes: Back to some more good quality biohacked sleep! Slept so well and woke up naturally at 0130am. This gave me so much productive time to catch up on blogging, YouTube-ing, instagramming and face booking! In other words, I feel like I’m extending my life haha. More time to do more things rather than sleep. What surprised me is the drop in HRV from 78 to 65! I can feel the fatigue from yesterday’s workout but did not expect such a huge drop of -13! Although the app says I’m fit to continue training, if it drops again tmr morning, I will take the morning off or just grease the groove. It it continues dropping the following day, I will take the entire day off. Notes: Wanted to give my feet a break from all the standing, walking and pounding but still wanted a full body workout and aerobic effect. 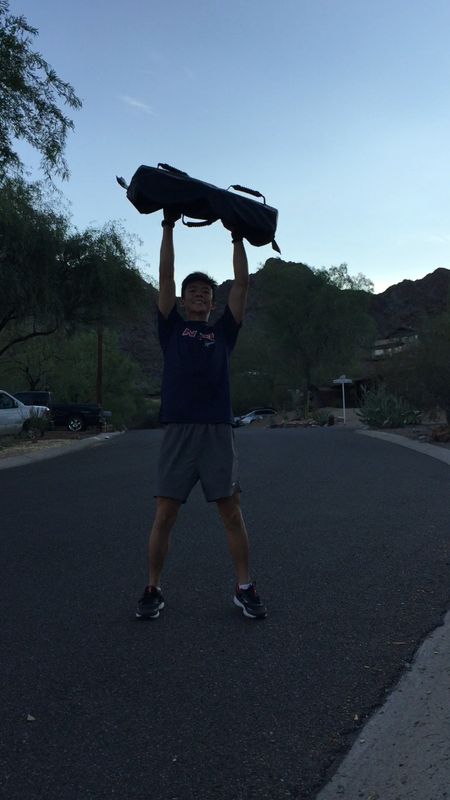 Sandbag carries are an awesome quick-fix, efficient workout that gives you both a great cardiovascular response and helps build muscular strength & stronger bones. It’s as simple as picking something heavy off the floor, walking as far as you can and switching sides whenever you feel tired. You can even do this with your groceries! Notes: By the third set I was spent! Could not do the Burpees continuously anymore. With each passing set I was feeling more and more ready to give up. However, somehow I just kept telling myself that this is nothing. I can handle it. It’s like resetting my frame of reference to see things in a different light. Interestingly, with each passing set, things just got ‘easier’. I no longer focused on the burning lactic acid in my legs, or of the humming of my beating heart racing in my chest. I felt like a robot that could continue moving forever. It was a strong mentality and once again affirms to me of the power of the mind. Lesson learnt: next time you’re in a tough/difficult situation, tell yourself “it’s nothing, I’ll get through this.” It will become a self fulfilling prophecy that’s sure to keep you going. Don’t harp on the negative. Change your frame of reference!